The redesigned 2018 Volkswagen Tiguan hits the mark with bold new styling inside and out. The compact SUV even offers a highly-functional third row of seating! And let’s not forget all the new tech and performance! iDriveSoCal’s Bernadette Sanicola picked one up from Ontario Volkswagen – hear all the details of her test drive review in this iDriveSoCal Podcast. The all-new 2019 VW Jetta Launch Party drew Riverside, California resident Ian Duarte to Ontario Volkswagen to test drive the high-tech new ride. Ian rode along with his friend Michelle Bentley and the two diehard Volkswagen fans had nothing but high-marks for the latest innovation from their favorite automaker. Hear Ian’s review of the 2019 Jetta in this DriveSoCal Podcast. Bernadette Sanicola: Awesome price point. Awesome look to the car. It’s stylish. I love the interior. I love the styling. I thought it was luxurious. And of course, the space. I loved it. I loved how much I could fit. Tom Smith: Welcome to iDriveSoCal, the podcast all about mobility from the automotive capital of the United States, Southern California. Tom Smith here, with Bernadette Sanicola. Bernie Sports @berniesports, if you follow her on social media. Today, we are talking about our good friends out at Ontario Volkswagen in Ontario, California, Los Angeles suburb of Ontario, California. Specifically, their 2018 Volkswagen Tiguan, which Bernadette was just telling me that something that I didn’t know about the Tiguan. First off, Bernadette, thank you for joining us again. Bernadette Sanicola: Thanks for having me. Tom Smith: And the Tiguan is what, now? The name. Bernadette Sanicola: The name. Well, everybody mispronounces it, so it was my first question. Bernadette Sanicola: Via, Volkswagen has these different names. Bernadette Sanicola: This is a tiger and an iguana. Tom Smith: That was told to you by Scott. Tom Smith: Scott Reed, at Ontario Volkswagen. Bernadette Sanicola: Yes, and everyone around me. Bernadette Sanicola: I am not. Tom Smith: And pulling my leg, and at the end of this recording, you’re going to be, like, “Oh, yeah, by the way, we have to do this all over, because I was totally joking”? Bernadette Sanicola: And I did ask Scott, multiple times. This is true. Bernadette Sanicola: So I took the words from him, and then, I drove the car, and it lived up to the name. Tom Smith: Okay, so, tell me about that. Bernadette Sanicola: You’re still trying to think of how a tiger and an iguana can work together. Tom Smith: Yeah. Yeah, I’m just going to let you tell me about it. Yeah. I’m trying to process it, like, “Okay, this is, so it’s like this?” It’s like, ah, just tell me about it. Bernadette Sanicola: Yeah, it’s funny, because I was trying to figure out what elements were, but the car was great. I mean, at for, again, awesome price point. Awesome look to the car. It’s stylish. It’s got that square look that I like, that kind of broad-shouldered look. Bernadette Sanicola: Okay, so, I drove the top of the line. Bernadette Sanicola: I drove the SEL Premium. Tom Smith: Yeah, that’s big for that class, right? Bernadette Sanicola: Huge! And still has a trunk, still has a space in the back. Which, I thought, “Wow,” so that was the big wow for me. Tom Smith: Now, I saw one. The pictures that you shared, you drove a dark gray color, and I saw one on Onatrio Volkswagen’s lot, that was this really good-looking, eye-popping, but conservative eye-popping, if that’s possible, kind of orange-ish, kind of a burnt orange color, that I thought looked gorgeous. Bernadette Sanicola: It’s bigger, it’s better, and everything’s coming out bigger, wider, taller. Bernadette Sanicola: But with this one, it’s also got the dynamics of the body, the outside of the exterior and interior. An exterior’s a little more square. Bernadette Sanicola: A little more like your Atlas. It’s kind of like the Atlas [crosstalk 00:03:53]. Tom Smith: Yeah, it looks like a smaller Atlas. Bernadette Sanicola: Right, so, and people that love the Atlas, Scott mentioned that this was the last Tiguan at the dealer, that day that I drove. Bernadette Sanicola: So they’re going quick. Tom Smith: Wow. Yeah. Okay. Bernadette Sanicola: When you have cruise control on. 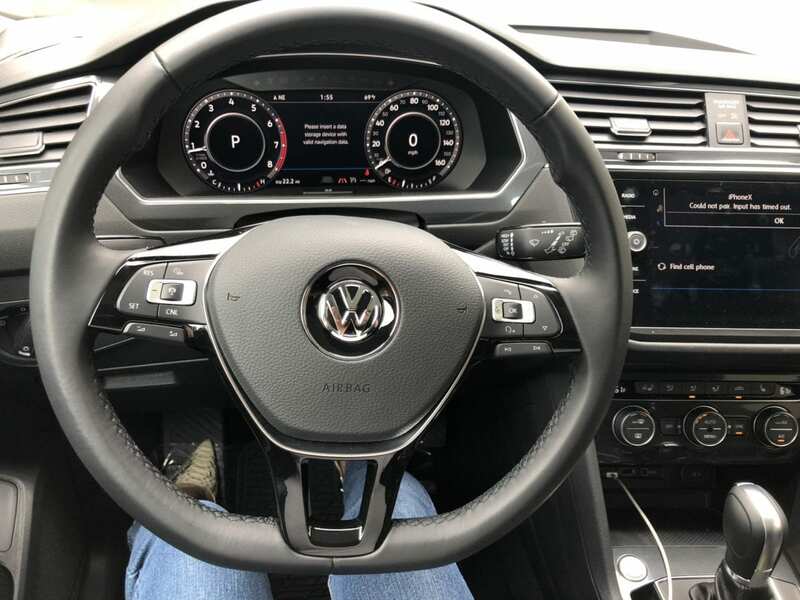 Bernadette Sanicola: It had frontal collision, it had the backup camera and side view cameras, instant AppleCar Play and Android Auto, touch screen, big screen … I mean, the car, it is truly a German vehicle. I loved that third row, and you can really, easily, move them up and down. Third row seats are usually like, how the heck can I figure this out? Bernadette Sanicola: Where do I … And how do you squeeze a kid or a person back there, to pull this? Bernadette Sanicola: This one, up and down, as easy as can be. I literally did it three times, to see if I was just lucky, the first time around. But I’m like, “Oh, my gosh, if I had more than one person or child or friend …” If my kid had a lot of friends, this is the car. I’d get in the second and the last row. Tom Smith: So it’s a, seven-passenger? Tom Smith: Okay. So, gorgeous outside. Tom Smith: Stylish inside. Solid drive. Acceleration? So, from a performance perspective, getting on the highway, no problem. Bernadette Sanicola: Oh, yeah, it’s great. No problem. Bernadette Sanicola: Absolutely no problem. Tom Smith: You have a little air kick tailgate thing? I like that, too. Bernadette Sanicola: Yeah! If you have a bunch of people, or let’s just say, kids, with you … Honestly, or dogs? Bernadette Sanicola: Absolutely. That was the most impressive part. I wouldn’t never even consider a third row, until I saw this car, because the third is so easy to pull up, pull down, and it’s there, it’s not there. And you still have the space. You don’t sacrifice anything with this car. Tom Smith: Okay, so you had the Fender audio system, as well? Bernadette Sanicola: Yes, which was awesome. Bernadette Sanicola: I’m seeing Fender, it’s like, a guitar. Tom Smith: Yeah, and to clarify, yes, I am saying, Fender, F-E-N-D-E-R, but I’m not referring to Fender, as in the car part. I’m referring to Fender, as in the guitar and amplifier company. They’re putting in an audio system in the premium, top of the line Volkswagens, which is really cool. Tom Smith: I’m not sure about the other models, but in the top of the Line Tiguan, and the top of the line Atlas, you can get a Fender audio system, and it sounds fantastic. Bernadette Sanicola: It’s awesome, yeah. It was really good, and it’s the first thing I tested, yeah, was the music. Tom Smith: So, real quick, before we go to top three. What are we looking at for gas mileage? Bernadette Sanicola: It was great. It was, 27, highway, 22, city. It also had those elements to it, where it can go into those ECO PRO modes. Like, I noticed, when I pulled over, to kind of jump out and check out the tailgate, it turned itself off. It has elements to save you even More fuel, if you’re not thinking about it, which I loved. Even the auto stop start, which is something that, at a stop light, it turns itself off. Tom Smith: Awesome. Okay, top three. Tom Smith: What is the sticker on what you drove? Bernadette Sanicola: Uh, 30s. Mine was 37. Bernadette Sanicola: So, fully loaded. I mean, that’s great. Tom Smith: Yeah. Great value. Bernadette Sanicola: Really great value. Tom Smith: A lot of car for the money. Bernadette Sanicola: I’m like, I’m thinking, “A lot of people with that.” I love the interior. I love the styling. I thought it was luxurious. And of course, the space. I loved it. I loved how much I could fit. I could probably use that car, as a moving car, if I was going to move again, which I would never, ever want to do it. Tom Smith: You talk a lot about moving, in relation to cars. Bernadette Sanicola: This car, when your kids want to borrow that car to move, you don’t need me. Take the car, and go. Because they can do it! My dad would be happy to hear that. Tom Smith: Yeah, yeah, and I chuckle, folks, because I know Bernadette’s date, well, so, it’s funny. Sorry, it’s a little bit of an inside joke, but … At any rate. Bernadette Sanicola. Thank you so much for that vehicle review of the 2018 Volkswagen Tiguan, from our good friends out there at Ontario Volkswagen. Go say hi to our pals out there, Earl Reed, Scott Reed, Randy Halcomb, and Jim Straley, the service director. For iDriveSoCal, I’m Tom Smith. Thank you, as always, for listening.